Quick Fist holds objects 1” to 1 ¾” (25mm to 57mm) in diameter. 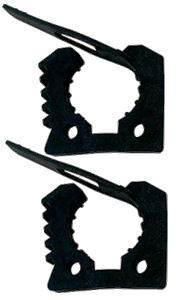 Mounts easily to keep shovels, axes, hoses and other tools or implements securely in place. Use on work vehicles, trailers, fire and police units, off road trucks, military equipment, 4x4s, ATVs, RVs, boats or on any wall. Includes two Quick Fist Clamps, hardware not included.